Frank Mullen's very unofficial source of poop, skinny and bitching for present and former U.S. Navy Musicians. Here beats the heart of the American fighting man. This is the shy guy who will give his all and then some, just for the opportunity to serve. Sure, he's a little rough around the edges, green, in need of some squaring away. But underneath, he's the man you want standing next to you in your unit, in your band. My goodness, I'll never understand why CRUITCOM turned him down. Warning: Strong language follows. Viewer discretion is advised for French horn players, flautists and others of delicate sensibility. In my ongoing quest to make Navy Lyres accessible to OMCs (Old Men with Computers), I've addressed the frustrating task of leaving comments to blog posts in the accompanying video. You can do the first three in any order but, of course, pressing the "publish" button must be last. You have stood on the decks of ships in howling winds playing Fillmore marches during UNREPS. You have performed rock 'n' roll in high school auditoriums at 0800 while everyone in the room was still asleep, including the principal, the senior class and the horn section. You have stood tall as foreign crowds screamed their anger at the United States and stood humbly when they roared their approval. You can post a stinking comment at a dipstick blog. As a musician, you'll serve as a musical ambassador for your country. Generous salaries and allowances provided. It's not just a job: it's the Russian Navy. Warning: This 60-second clip has been known to awaken dormant feelings of pride in viewers who have served in the United States Navy. Side effects may include leaping to one's feet, snapping to attention and shouting "Oo-rah!" NMA President Terry Chesson called me a few hours ago with sad news: Noonie Wilson died this morning. As the School of Music's Senior Instructor, Noonie oversaw the training of hundreds, maybe thousands, of Navy, Marine Corps and Army musicians. He described his job as that of the school's "Principal." Students who were summoned for counseling in his office--a Navy-issue desk, locker and grease-board roster of instructors hidden behind a row of grey file cabinets--would agree with that assessment. Whether handing out a Mandatory Practice slip to a lazy drummer or an "attaboy" to a trumpeter who had finally squared himself away, Noonie treated each student with respect; good news or bad, you walked out of the Training Office knowing you'd been treated fairly. I know this because, as an instrumental instructor, I frequently took students to see the Senior Instructor. And years later, while struggling through the Advanced Course, I was the student who got the call to report to Master Chief Wilson. Funeral arrangements are being handled by Altmeyer Funeral Homes. Deb Holl tells me the viewing is 6-8 PM, Thursday, 8OCT, and funeral services the following morning, 11 AM, Friday, 9OCT. The funeral home's website will soon provide the opportunity to leave online condolences. The race may be to the swift . . .
As you can see from this short clip, Four Star Edition, a contingent of the U.S. Fleet Forces Band, is an energetic group. These young professionals know how to rock and roll. But--and I ask this with all humility--do they have what it takes to go the distance? Are they sprinters who exhaust their energy after the first lap, or are they marathon runners who pick up their second wind late in the race? Mark your calendar: the next Navy Musicians Association reunion is scheduled for June 18-23 in Milwaukee, Wisc. 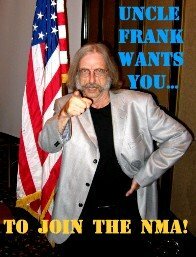 You can easily join the NMA with a telephone and credit card. Just call Treasurer Stephanie Rowland at 410-353-5967. Theme images by MichaelJay. Powered by Blogger.